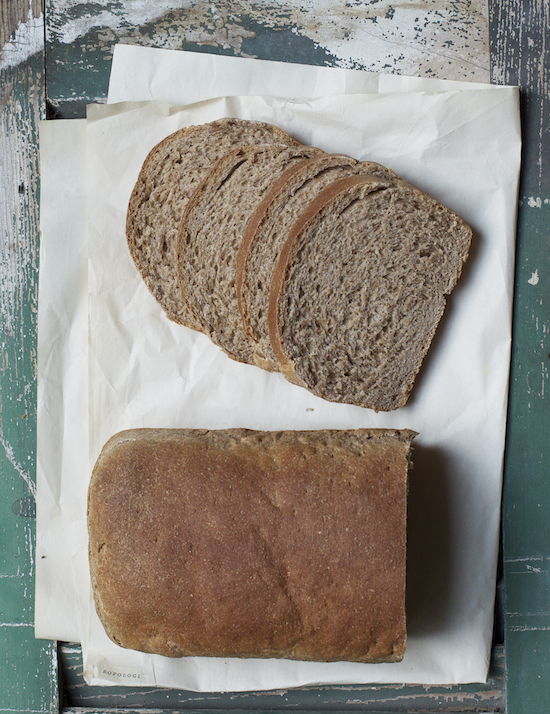 I am super excited to share Red Star Yeast's Whole Wheat Sourdough Bread with you today. I conquered both my fears of baking with 100% whole wheat flour and sourdough at once. Sourdough and whole wheat baking might seem daunting to most, but in all honesty it turned out to be a breeze. A little boost from active dry yeast goes a long way while still achieving the distinctly desired sour notes in sourdough breads. The sourdough starter pretty much sat there on the counter, while once in a while I stalked it with a chemist-like excitement. A couple key points: Use active dry yeast, instant yeast is not interchangeable in this case. Instant yeast does not work well for refrigerated doughs. Visit Red Star Yeast's Lessons in Yeast and Baking for more information. The sourdough starter would seem too thick, chunky and flour-y at first but just let it go through its metamorphosis. It will reach the consistency you see above, overtime. Finally, I use heat resistant glass or ceramic bowl to proof doughs. Both conduct heat well and the dough rises beautifully. As extra insurance I turn on the oven below to 350F and proof on top of the cold stove (no hot burners) above. A warm corner on your counter would work just as well. This post is a part of my ongoing professional collaboration with Red Star Yeast. See the full list of posts and recipes below. Replenish* remaining starter with 3 parts whole wheat flour to 2 parts water and 1 teaspoon sugar. Stir until blended, some lumps may remain. Cover loosely and let stand in warm place for 10 to 12 hours or overnight. The starter will rise and become bubbly. Stir and store in refrigerator. The ‘replenish’ depends on how much starter you use for a recipe. Example, if you use 1 cup of starter for a recipe, then you replace it with 1 cup flour, 2/3 cup of water and 1 teaspoon of sugar. The flour amount is the same amount as starter that you removed; the water is 2/3 of the flour amount. Once it’s been replenished, allow it to sit at RT for about 12 hours for the yeast to become active again before it’s refrigerated again. Happy baking! Combine sourdough starter, dry mixture, and liquid ingredients in mixing bowl with paddle or beaters for 4 minutes on medium speed. Gradually add remaining flour (I need 2 1/3 cups whole wheat flour total) and knead with dough hook(s) 5 to 7 minutes until smooth and elastic. Place dough in lightly oiled bowl and turn to grease top. Cover; let rise until dough tests ripe . Turn dough onto lightly floured surface; punch down to remove air bubbles. Roll or pat into a 14 x 7-inch rectangle. Starting with shorter side, roll up tightly, pressing dough into roll. Pinch edges and taper ends to seal. Place in greased 9 x 5-inch loaf pan. Cover; let rise until indentation remains after touching. Bake in preheated 375º F oven 30 to 40 minutes. Remove from pan; cool. A beautiful loaf of bread! It must be really flavorful. Your loaf looks wonderful! I've been baking sourdough breads this year and I love the whole wheat flour! שולי - הלחם פשוט נראה נהדר! הקמח המלא בו אני משתמשת הוא תמיד 100% והוא בטחינה דקה (אבן ריחיים) - לא יודעת אם זה אותו הסוג שלך יש, אבל העבודה איתו היא כמעט כמו קמח לבן. בכל מקרה אני אוהבת את מרקם הלחם שלך! Whole wheat AND sourdough? This sounds like perfection! Nothing beats homemade bread. I want a piece of this yummy bread, still warm, with butter and jelly or a sandwich, or a piece of toast or........ It looks fabulous! Gorgeous loaf, Shulie! So wonderful that you were able to work well with whole wheat flour in a sourdough recipe with Red Star Yeast. So pretty when sliced! This bread looks like - perfect. And wholesome. I need wholesome right now! 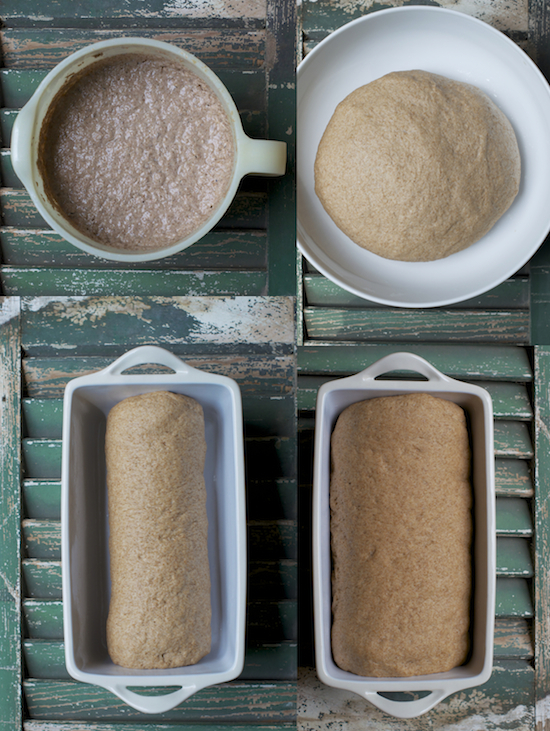 Starting a sourdough bread starter is on my "things to cook" list. 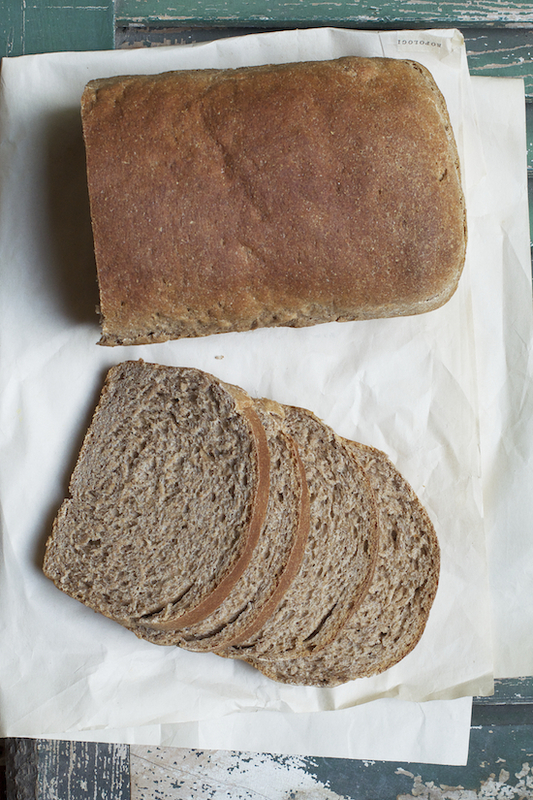 Your scrumptious Whole Wheat Bread is tempting me to begin my own starter! An exceptional loaf! You are such a master when it comes to bread baking. My hubby loves sourdough..but I've never thought of making my own starter. I need to do that. I'm still enjoying the amazing Red Star Yeast I won through your blog...thank you, again!!! I make 100% whole wheat bread for myself, but never tried it with sourdough. It´ll become my favorite, I know it! Looks sensational Shulie, and I like the easy starter from red star. That is one great looking loaf. Also your beagle looks so adorable! The bread looks so airy and nice. I've never tried sourdough at home, spoilt starters couple of times...might try it again sometime. Love the recipe! Prior to your recipe, the score was Whole Wheat Sourdough 3 Me 0. This has now become my wife's favorite bread. I've also started using molasses instead of sugar for a little extra flavor. Oh yeah, the easy way to check if it's done is to measure with a meat thermometer - done at 205°F internal temp. Great recipe - thanks! Prior to your recipe, the score was Whole Wheat Sourdough 3 Me 0. This has now become my wife's favorite bread. Oh yeah, helpful to note that the internal temp should be 205° when done - much better than thumping the loaf - overcooking bread is almost a mortal sin. What speed do you use on the mixer when using the bread hook?